Fred Palmore is a retired partner at Troutman Sanders LLP, an international law firm. Palmore graduated from William & Mary with an A.B. in history in 1967 and a J.D. from the University of Richmond Law School in 1973. During the Vietnam War he was an officer in the Navy. While practicing law, he was recognized as one of the Best Lawyers in America in multiple categories for 20 years. He recently retired as an adjunct professor at the University of Richmond Law School. He has served on the planning committee for most of the five-year reunions of the Class of ’67, including the recent 50th reunion. 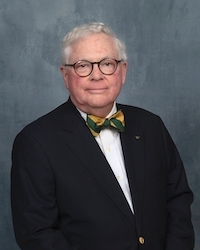 He also was a board member of the Fund for William & Mary and is a member of the Tribe Club. Palmore is married to Pamela Goodrich Palmore ’68, M.A.Ed. ’74 and they have two children. Their son is a graduate of the Raymond A. Mason School of Business.